Scott K. Powers is an exercise physiologist who specializes in investigating the effects of muscular exercise on both cardiac and skeletal muscle. Specifically, Powers’ research has focused upon exercise mediated changes in cardiac and skeletal muscle antioxidant systems and the role that these changes play in providing cardiac protection during a heart attack. Further, Powers is actively investigating the mechanisms responsible for respiratory muscle weakness in patients subjected to prolonged periods of mechanical ventilation. 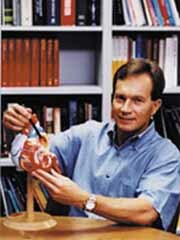 Powers’ work has been funded by grants from the National Institutes of Health, American Heart Association-Florida and American Lung Association-Florida. This research has resulted in more than 100 peer-reviewed scientific papers. Results from his laboratory are widely quoted in the literature and he is invited to lecture around the world. Powers is an enthusiastic and accomplished teacher, having earned two University of Florida Teacher Improvement Awards (1993 and 1996) as well as being named teacher of the year in the Department of Exercise and Sport Sciences in 1992. He has co-authored four college textbooks for use in exercise physiology courses. In addition to teaching awards, Powers has received several academic honors including being elected president of the Southeastern Chapter of the American College of Sports Medicine (1986) and vice-president of the American College of Sports Medicine (1997-99). Powers was selected to be the Southeastern American College of Sports Medicine Scholar in 1995 and he has earned a Career Enhancement Award from the American Physiological Society. He has served on grant review study sections for the National Institutes of Health, American Heart Association-Florida, and NASA. Powers also serves on numerous editorial boards for scholarly journals including the Journal of Applied Physiology.